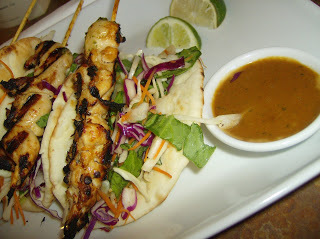 Long ago and far away, Milestone's Restaurant offered a Thai Chicken Taco entree on their menu. When it was removed was close to the last time I set foot in their restaurant. I have tried a few recipes to no avail and have emailed the powers at be to see if they would be willing to share the old recipe or at least add it to the menu again. No response as of yet. Fusion food has always been a favourite of mine. I love to be surprised, so taking classics and reinventing them makes food fun in my opinion. 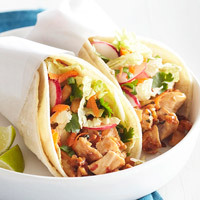 In my Let's Talk Food tab there are several examples of this such as Honey-Lime Chicken Enchiladas and Yam Pad Thai - both recipes with great flavours. In a web search I did find a recipe that was based on one from Better Homes and Gardens. It was worth a try. While I still didn't find it up the the level of the original Milestone's offering, it was a hit with the family. Below I have taken the original Better Homes and Garden recipe and made a few change based on the adjusted recipe on another blog called (Mis)adventures in Cooking. The two things to consider when making this recipe is the serving amounts and the tortillas. The original magazine recipe takes 16 heated corn tortillas, layers them in 2's and you end up with 8 tacos. Unfortunately, the corn tortillas available to most of us are not of a quality good enough to use this way and would overpower the filling. Interesting to note that in the magazine's image above - they hardly look like the thick corn tortillas found in most stores and the tacos definitely look fuller than they did for me. I prefer flour tortillas for this recipe and just 1 per taco so I can taste the filling better. Also, there isn't a lot of filling per taco, so if you like your taco to be on the fuller side - this recipe really only makes about 4-6. On this blog I decided to come down in the middle and make 6, but it's really up to you how much filling per tortillas works best. Note -The small flour tortillas found in most supermarkets are a definitely larger than corn tortillas - so 4 would be perfect for my family. If you can find them in the smaller size, then 6 would probably be best. I hope you enjoy this as much as I did last night! That said, if anyone has access to the original Milestones recipe, please share it with me. They were to die for. 4-6 Tacos depending on how much filling you like. Jucie 1 lime half and cut remaining half in wedges. Stir together chicken, cilantro, shallot or onion, garlic, lime juice, fish sauce, soy sauce, crushed red pepper and chili sauce. Cover and refrigerate for 1 hour. In large skillet cook chicken mixture - stirring constantly - in hot oil over medium-high heat for 5 minutes or until the chicken is cooked. Mix together first 6 ingredients in medium bowl. Add rice vinegar and mayonnaise and toss gently to coat. Heat the flour tortillas. Divide the meat evenly and top with slaw. Serve with the lime wedges. For the original Better Homes and Garden recipe from June 2011 click HERE.